Sweet potato casserole is one of my favorite Thanksgiving dishes, but let's face it: you're basically eating dessert that's being disguised as a vegetable. So why not drop the act and actually eat it as a dessert? That's what these bars are, and they are a delicious dessert at that. Or a delicious snack. Or if I'm being totally honest here, a delicious breakfast. The bars are denser than cake, and a little lighter than a brownie or blondie. Sweet potato puree is mixed into a batter that's full of warm fall spices: cinnamon, nutmeg, and ginger. And then after they are baked, they are topped with marshmallows and toasted. Is there anything better than toasted marshmallow? I think not. If you are looking for a casual dessert or snack for the Thanksgiving season, these are a great choice. I'm thinking that I'll make them for our next tailgate - portable, festive, and most importantly, delicious. Preheat the oven to 400 degrees. Scrub the sweet potato and poke a few holes in the top with a fork. Bake 45 min to an hour, until it is cooked through and soft. Remove from oven, allow to cool until it is cool enough to handle, then peel and mash with a fork until smooth. Measure out 3/4 cup of the puree and set aside. Decrease the oven temperature to 350 degrees. Line an 8x8 inch baking dish with foil, and spray with cooking spray. In the bowl of a stand mixer fitted with the paddle attachment, cream the butter and sugar at medium speed until light and fluffy, 3 to 5 minutes. Add the eggs, one at a time, scraping down the bowl as needed. Mix in the vanilla and the salt, cinnamon, nutmeg, and ginger. With the mixer on low, slowly add the flour, and mix until just incorporated. Using a rubber spatula, fold in the sweet potato puree. Pour the batter into the prepared pan and bake 26-30 minutes, or until a toothpick inserted into the center comes out clean. Scatter the marshmallows over the top, being sure to cover the entire pan. Preheat the broiler, and broil the bars until the marshmallows are dark golden-brown. You may have to rotate the pan a few times depending on how evenly your broiler cooks. Remove from oven and allow to cool to room temperature before cutting into bars. Wow. This looks ridiculously good! I gotta make these! They look so yummy! I love the toasted marshmallows. Reminds me of camping and roasting marshmallow around a campfire! I love these - yum! 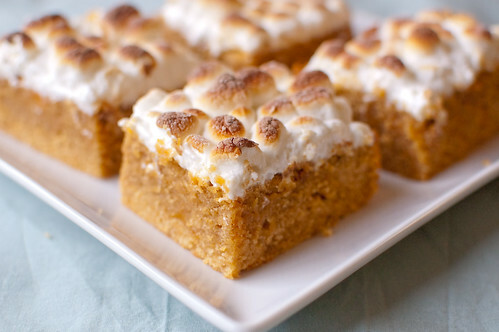 The marshmallows on top look like they were perfectly browned and the sweet potato layer on the bottom looks creamy and delish! They look so good. I've never been a fan of sweet potato casserole myself. They look much better in this form. I am so in love with this idea. And hellooo, you called out fake vegetables, which is pretty much awesome!! These look absolutely amazing. I have just found my contributions to the Thanksgiving feasts I'll be attending this year. Oh my goodness - I totally want to try these for Thanksgiving!! This sounds so yummy! I've never tried this casserole and it's so popular on so many blogs. Love it! This will be filed under the Misc Sweet Potato file right alongside Sweet Potato Biscuits. Is there not a more versatile & delectable vegetable? Alright the sweet factor sure helps its case. mmm. I'd much rather have my sweet potatoes for dessert with a recipe like this! What's the purpose of scrubing the sweet potatoes if you are going to peel them anyway. You don't HAVE to, but if the outside is dirty, and you are holding the sweet potato to peel it, you'll just transfer some of the dirt and pesticides onto the peeled part as you go. Hope that makes sense.